It is an exciting moment when your shop goes live! Before you hit the GO LIVE button, please check the domain is set up properly (you might thave to contact your ISP) and please have a quick look at the below checklist to make sure your shop is ready to go live. One crucial other point: Test, Test, Test. Please do a test order on your own shop to see if everything is working as it should. Make sure all images are of the right size and optimised for web. If they are too large they will slow down the loading time of the site, which is particularly bad when users search in bad reception areas or on phone connections. More about images here. Make sure you have no spelling errors on your website. Contact page - add at least an email address and / or a contact name and number. 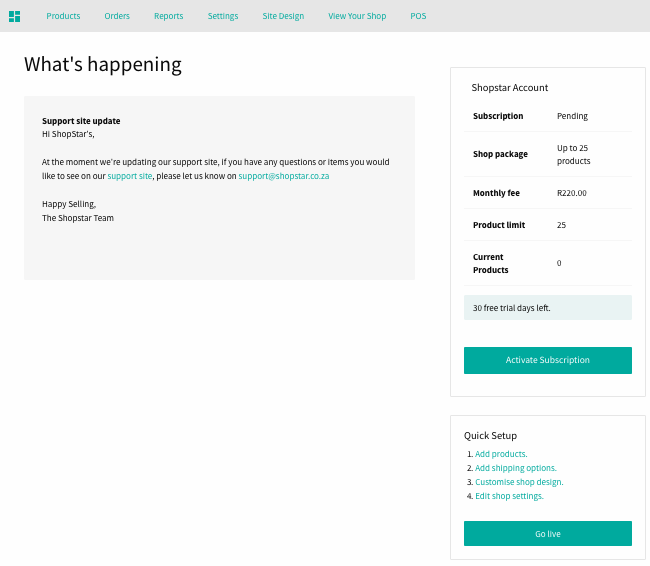 Information page - add a page with basic information about your shop, how you handle orders, shipping and returns. Here is more information. Ensure you have added proper company details. Check your domain has been set up correctly. More on this here. Thoroughly research shipping costs for your shop and check that your shipping options have been added correctly. We recommend to use a win some, loose some approach, as you don’t want to make it too expensive to buy your products online. More on shipping settings here. Make sure you add 1 or multiple payment options for your customers. Make it as attractive for them to pay for your beautiful products. Test all your internal and external links and menu items. Add descriptions to all your pages. Consider some launch specials - ZAR 50 off, free shipping, a Facebook competition or similar. Set up a Facebook page, Instagram, Twitter - at least one of these and provide new content regularly and consistently. Set up a Newsletter (Mailchimp)- and send out one every 3 months. Consider Google Adwords or a Facebook promotion. Update content (images and text) often to keep your shop fresh and interesting for repeat visitors.